Several severe accident models were installed by CORYS on US nuclear plant full scope simulators these last few years. The training course described below was a first-of-a-kind. It appeared to be a creative and very effective training exercise, and received high marks from the licensed operators. This first lesson plan being developed was initiated by an extended station blackout with no injection source available. It was similar to what happened at Fukushima nuclear station, for which the time to significant fuel damage was much greater than the maximum 8 hours time slot dedicated to training. Therefore, a training drill was initially developed and fully run by instructors in real time, with snapshots taken at significant milestones of the transient as depicted in the below graphic. Different crews then took the training duty and the station blackout was triggered by the instructor. The team responded and took operator actions. By doing this, the crew was able to practice responding to a station blackout and reached the point of entering the severe accident management guidelines, followed by a long path with no operator actions for a long period. The simulator was then frozen reset to point T1. Before restarting the simulator in real time from this point, the crew was briefed that all previous actions were unable to be performed, then about the time elapsed and the current plant conditions. He was given time to evaluate conditions and then simulator placed in run. The large amount of fuel damage that occurred resulted in high H2 levels. Crew evaluated levels and then lined up to vent and purge containment. Following vent and purge lineup, simulator was again frozen then reset to T2, immediately before core collapse. Crew was briefed that venting was unable to be performed, and allowed time to review panels for current plant conditions and determine what procedure actions should be taken. Simulator was then placed in run. Crew observed plant response for core collapse, simulator placed in freeze, and response discussed. Then reset to T3 and did a similar evolution with vessel breach. Two anecdotes were noted with a particular interest. When the core collapsed into the bottom of the vessel resulting in a vessel pressure spike, SRV (Safety Relief Valve) open alarms, and H2 production, a discussion took place on what caused the changing plant parameters. Most crews did not recognized that the changes were due to core collapse but instead thought some injection source had been restored. This was of significant importance as the Severe Accident Management Guidelines (SAMGs) to be used in the two different plant states were totally different. This allowed then for discussion on operator fundamentals. 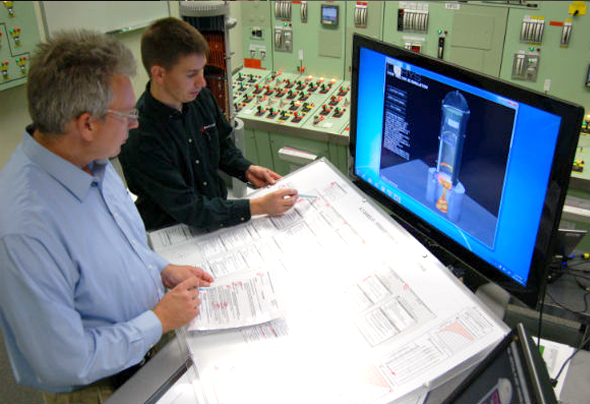 This is during such case that the 3D-dynamic visualization tool was then utilized to show the core collapse and reinforce why the plant was responding the way it did. During evaluation of vessel breach, procedure has a vessel breach indication of “high or rising drywell temperature”. Prior to vessel breach, containment temperature was indicating approximately 300 °F. On the checklist, multiple crews evaluated it as high drywell temperature and would have misdiagnosed a vessel breach. Again, using the 3D-graphic, it was reinforced that the vessel had not breached. A discussion of the procedural basis including analysis data was used to discuss what was meant by high drywell temperature. The scenario was then continued until vessel breach occurred and high or rising drywell temperature was demonstrated.